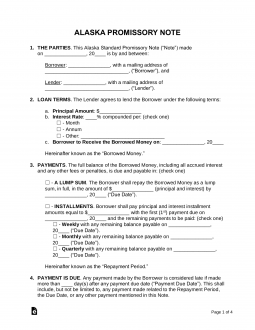 An Alaska promissory note is a legal document that outlines the terms of money that borrowed, by an individual or entity, for a term and interest rate agreed upon by the parties. In addition, the lender may charge fees for late payment and in the event of default by the borrower. Once the money has been transferred, with the note signed by both parties, the document goes into effect and the borrower will be liable for the payment to the lender. Secured Promissory Note – A promise to pay with the added security of having property of value to possess in the chance the borrower does not pay the note. Unsecured Promissory Note – Not recommended unless the borrower is a person that is a close friend or has a history of great credit. If the borrower refuses to pay the money back to the lender the only recourse would be small claims court ($10,000 or less) or other legal action. Under Sec. 45.45.010, the rate of interest in the state is 10.5 percent a year and no more on money after it is due except as provided in (b) of this section. (b) Interest may not be charged by express agreement of the parties in a contract or loan commitment that is more than five percentage points above the annual rate charged member banks for advances by the 12th Federal Reserve District on the day on which the contract or loan commitment is made. A contract or loan commitment in which the principal amount exceeds $25,000 is exempt from the limitation of this subsection.